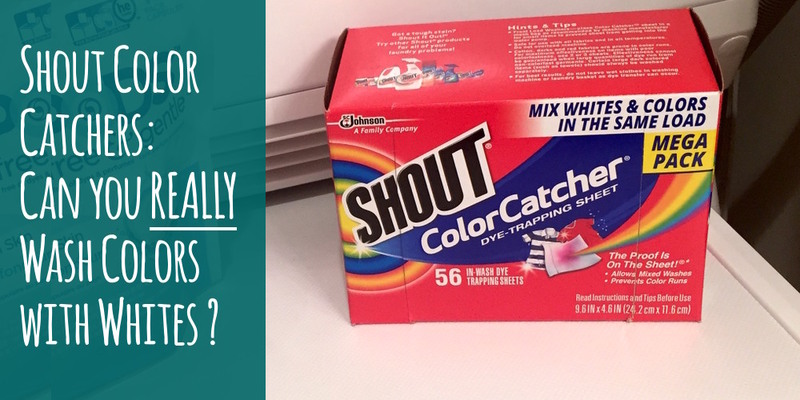 Shout Color Catchers Review: Can You REALLY Get Away Without Sorting your Laundry by Color? Have you heard of Shout Color Catchers ? They are single-use sheets that go in with your non-sorted laundry that claim to “absorb and trap loose dyes in your wash water, protecting clothes against color bleeds and helping preserve original colors” (a quote from the Shout Color Catchers website). I had seen products like this show up over the years, but had never actually tried them. So it was fun to try out something new for this Shout Color Catchers review! Now, let me just put a major disclaimer here: I in no way endorse mixing colors and whites in one load. In fact, I sort my laundry almost religiously and will never, ever wash white and colored clothes together. Or even light and dark clothes together. 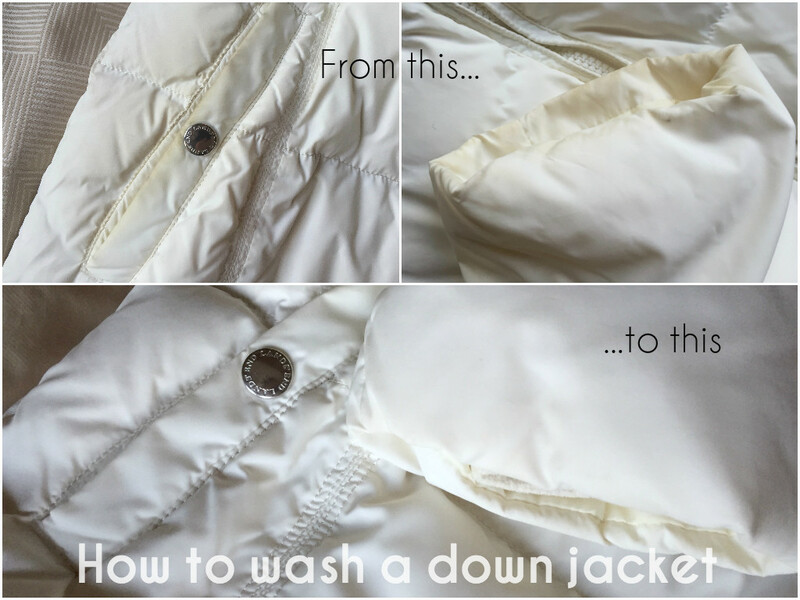 I firmly believe that if you want to keep your clothes looking good, the best (and easiest) thing you can do is spend a couple of minutes sorting. The reward? Non-dingy whites and colors that look good longer. But sometimes, just sometimes I find myself wishing I could combine whites and colors. Specifically when I wash microfiber cloths. 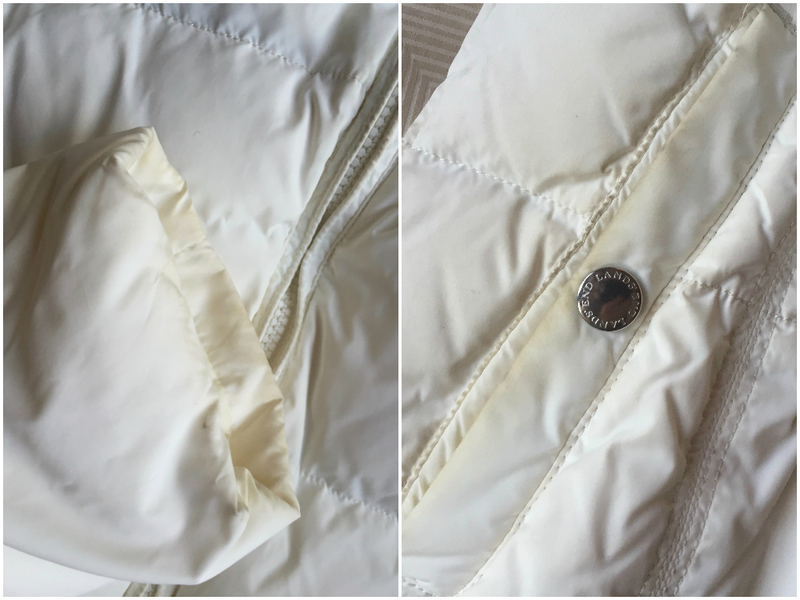 I use a ton of microfiber for cleaning – it’s probably the most used cleaning tool in our household (and you can read about how I use it and some of my other green cleaning choices in this post). We use microfiber cloths to clean everything from dog paws to bathroom counters to our ceramic stovetop, along with microfiber pads for the mop. And I have the cloths color coded so they don’t get mixed up: the bathroom cloths are white, the dog towels are orange and green and the kitchen towels are mostly pink and purple. I can’t believe I have only now gotten around to writing this review of my Miele W3038 washing machine . Just to give you some background, laundry has always been my favorite chore, but when I moved in with my now husband our condo did not have a washer. It didn’t even have space for a washer, since the hookups were in a tiny closet in the bathroom where we kept all our household stuff! So we spent several years using a wash and fold service (you can read more about that here) till I finally got my Miele W3038 washer and T8023C dryer as a wedding gift. That was a year and a half ago, and in that time I’ve really gotten a chance to test out the Miele W3038. I run on average 7-10 loads of laundry a week, and at this point have tested out every single setting the washer offers. I’ve also determined its strengths and weaknesses and have figured out the optimal settings for my daily needs. Read the rest of my Miele washing machine review to get the full details. Need some laundry gift ideas? 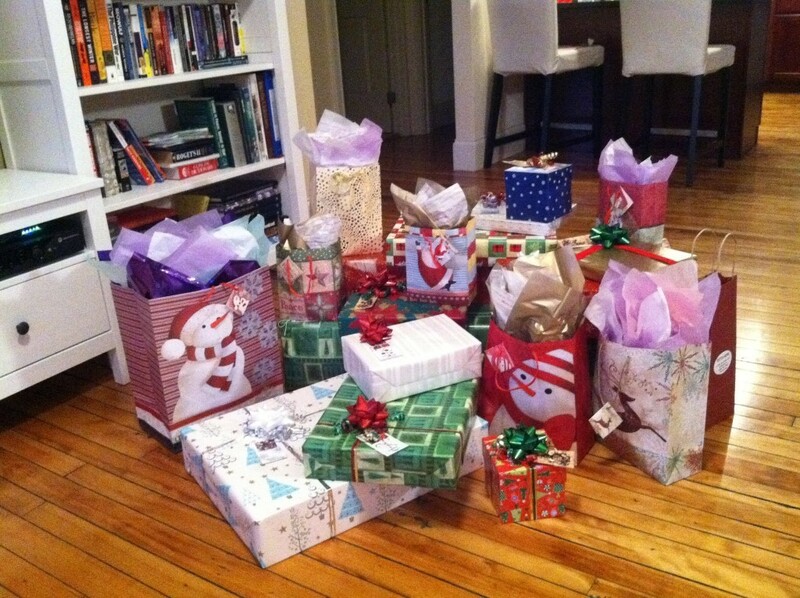 This is what happens when you start Christmas shopping early! I don’t know about you guys, but I am very much in the holiday mood already. I usually start buying stocking stuffers and making lists of gift ideas around October – that way I can avoid the “OMG two weeks left till Christmas and I have no idea what to do!! !” craziness that usually makes for some very pricey and not particularly thoughtful gift choices. While I was making all these lists I thought that it would be really cool to come up with some laundry gift ideas – these are probably most useful around the holidays, but can really be used year round. Unfortunately nobody in my circle shares my passion for all things laundry, but judging by all the great comments and emails I receive from my readers there are definitely plenty of you out there who could use this! My husband and I recently took a much needed vacation to Croatia (words can’t explain how much I love that country! 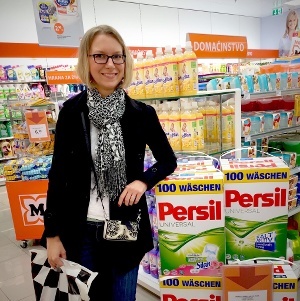 ), and as a true laundry nerd I couldn’t resist doing some laundry shopping. 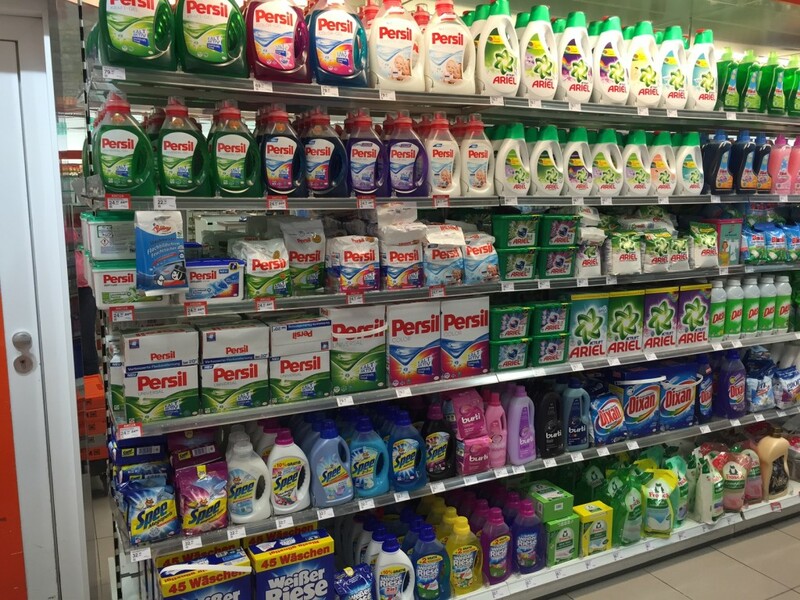 Regular grocery stores and supermarkets in Croatia carry mostly Austrian and Polish versions of laundry detergents, but they also have a chain of stores called Mueller that specializes in German-made products – from detergents to candy to socks. There is a giant 4-story Mueller right in the main square of Zagreb, so I spent quite a bit of time there gawking at cleaning supplies.